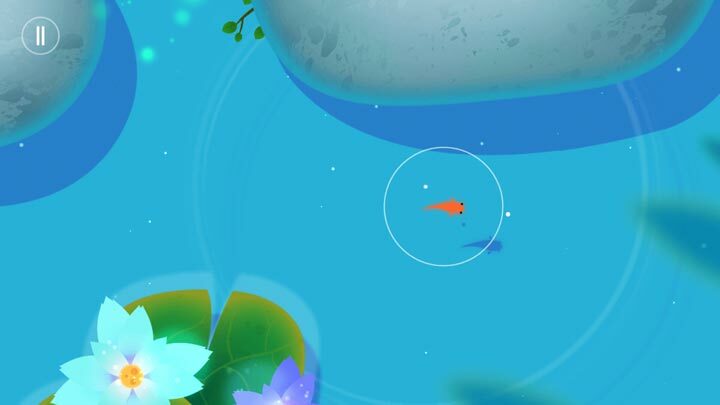 At first glance Koi appears to be a game about tranquility and peace. Finding harmony by helping other koi to freedom and going from pool to pool blooming flowers in an attempt to brighten a dimming world. But the Zen-focused puzzles here are subject to a couple very dark influences seeping into the waters, leaving the beautiful music and visuals to be marred by something sinister. The darkness is partly from some carnivorous fish you encounter, but much more so is the real trouble in the game- the horrendously sluggish controls. They are tremendously clumsy and awful, and it makes the game extremely frustrating when the giant black fish can dart through the water while you helplessly flounder to get away. The lack of a map or zoom features mean you can't truly plan alternative paths to avoid them either, as by the time one spots you, there's only a couple seconds to react, and of course, that isn't even half enough time to get your koi remotely out of the way. Even attempting to steer around the other koi to their necessary destinations is a pain, because they seem to get caught on everything in the way and lodged in odd places while following you and meandering all over the place. There problems inject a lot of stress into a game meant to be a relaxing aquatic experience. Due to the ultimately failing response times for movement, plodding your way through the story's lengthy levels (yes there is a small bit of story here) is a task only for the supremely patient. If the controls were more responsive, the game could've been a lot more tolerable, but the lack of balance between enemy speed and movement speed is disastrous here. It's the equivalent of trying to rake a Zen Garden while being followed by an angry 5 year old kicking and stomping their way through the sand. This Koi is, sadly, one that should be flushed with all the World's dead goldfish stores to that great bowl in the sky.